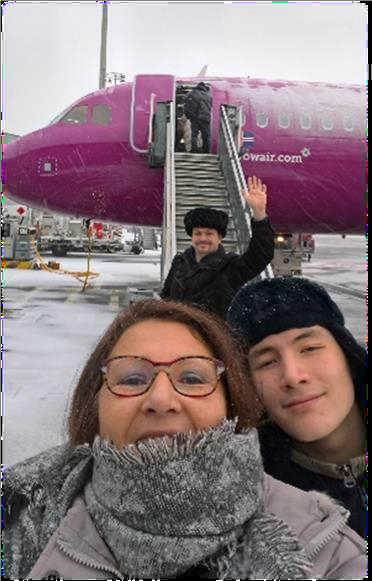 On January 22nd Daniel, Nicole and David Noort arrived in Toronto, Canada and after hours of waiting at the airport, they finally received their work permit for the maximum duration of three years. For them this was confirmation that they had arrived in the right place. Their team leaders had been waiting patiently for them. They took Daniel, Nicole and David to their new home in Durham where Ethnos Canada is located. Currently they are staying in the guesthouse until they can move in to their apartment, which is still occupied. Everyone was very helpful. For the first two weeks, meals were provided or they have been invited to go for a meal or coffee in order to help them settle in. They have tasted that God is good! Pray that they will continue to walk closely with God while adjusting to their new environment. They have already experienced a lot of snow. Temperatures plummeted from -10°F to -23°F. They were shown around campus and the village of Durham. They each bought some warm clothes and rubber boots rated for -40°F. In order to live and minister in the north they will need clothes which are able to withstand temperatures as low as -50 to -100°F. This is hard to imagine but clothes like this really exist. At the moment their belongings are on hold in Montreal at border security. Pray that they will be released soon so that they can pick them up in Toronto. It is already taking a lot longer than expected. Also pray for the arrival of additional paperwork from the Netherlands that is needed to acquire an Ontario driver’s license. David is attending the school on campus. He can graduate this year according to the American curriculum. He could go to a local school next school year in order to get the needed credits to graduate for the Canadian curriculum. They will have to decide what would be wisest for David and need to pray for wisdom. David has been able to connect with peers at school and Church youth group. Daniel, Nicole and David already have met some team members. The Martin family who have a similar background to them are also on campus. They have four little children and a fifth on the way. They have been on a vision trip to North-Quebec to see what life is like up there. First impression: COLD! There are more people interested to join First Story Ministries to work in the North but still need to raise support or are still training. It is hoped that their field orientation programme will start on 11th February. Daniel and Nicole have already started some required reading. Pray that they grow in strong loving fellowships with their fellow workers and people around them.